Anyway, if you have a few minutes to spare, we invite you to have a look around at Exclusive Meganisi - there are currently over 50 pages and several more to follow in the coming weeks, so make sure you're sitting comfortably! We would really appreciate your feedback and, if you like the website, please let Rebecca know via the Twitter or Facebook links, or email. If you don't like it, of course we had nothing to do with it... :-) And if you need your own website, or are tempted to visit Meganisi, you now know who to contact! Also, if you spot any typos or other errors, no matter how small, please let us know. In the last few weeks, we've been quite touched by the number of emails we've received, some from people we don't even know, enquiring after our well-being, as we haven't updated our own website recently. It's really quite humbling to think that people all around the world have enjoyed reading our ramblings for the last few years, and have taken the trouble to contact us when said ramblings dried up for a few weeks, so thank you all. It's not been all work though - as well as working we've continued to enjoy island life and we've had some glorious weather, as well as some not quite so glorious! We've had some great nights out with Barry & Trish, who have lived on Meganisi (and built some stunning villas!) for a number of years, and some of their friends. We've also had the occasional afternoon stroll, although we haven't had a long hike since we've been 'at our desk' most days lately. Snow capped peaks on the mainland. 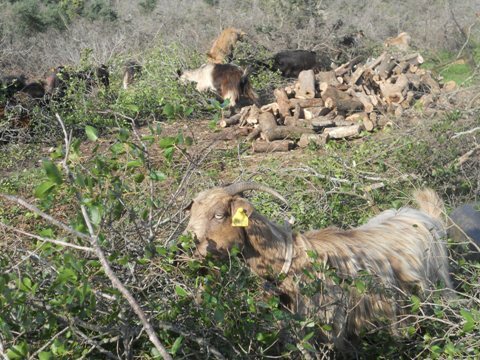 Goats on one of our regular walking routes - they never fail to amuse us with their antics! About a month ago, Vathy started to come alive, with taverna owners scrubbing, cleaning, pressure washing, polishing and painting anything that didn't move, and a few things that did! Flower pots and planters have been refilled, and all is looking Shipshape & Vathy Fashion for the season ahead. A week before Easter there were visiting yachts on the quay, most tavernas reopened, and we had a warm welcome and superb seafood dinner at Errikos. 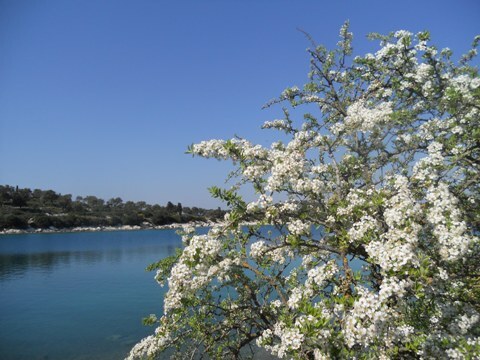 This was nothing compared with Easter weekend - the population of the island swelled enormously with visitors, mainly Greek, but also the first flotilla of the season. Easter is a very big celebration for Greeks, much bigger than Christmas, and a special time shared with friends and family. On Easter Saturday after an early evening drink at Petrino, seemingly busier than at any time we were there last summer, we had a return visit to Errikos for another seafood feast - who would have thought that mussels and feta cheese works, but it does, in the form of Mussels Saganaki! We had a convivial evening chatting to our table neighbours who were moored on the quay for the night, before stepping outside to watch the candle procession as the congregation emerged from church. This is when the evening really started - fireworks, firecrackers and general merriment ensued, and we were invited to a party at the marina which resulted in a rather late but thoroughly enjoyable night and an invitation to an Easter Feast the following day. Alas we already had our leg of lamb for Easter Sunday lunch, so whilst Ann was preparing that, I went to 'check the boat' at the marina. Is it wrong to have Grappa & cake before roast lamb?! More Greek hospitality, thanks to Yannis, Evi & co, and it was nice to see a Danish couple with a Bavaria 36 of similar vintage to Pipit who we last saw parked next to us in the autumn. 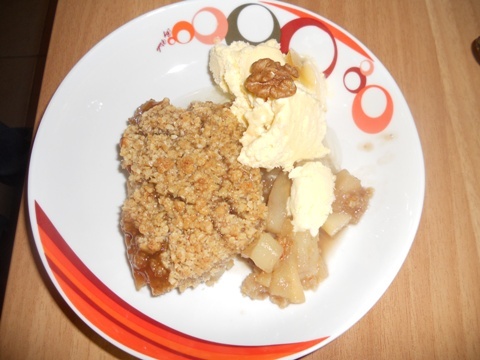 Whilst I had been away 'checking the boat' Ann had prepared a pear, ginger & whisky crumble for our Easter Sunday dessert. You can see her crumble recipe, along with another new one we've enjoyed several times over the winter - a slow cooker recipe for an aromatic Asian style shredded beef - on our Recipes page. 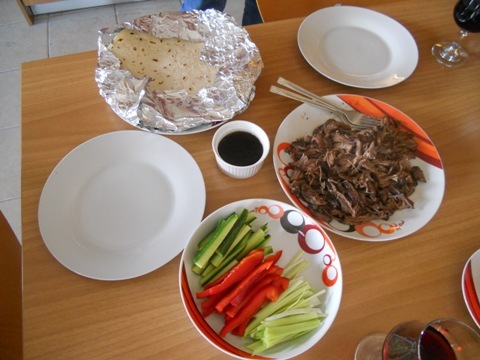 Asian style shredded beef - a slow cooker triumph! So, where were we? All at sea. Well metaphorically, not literally, but although we've thoroughly enjoyed living in the relative lap of luxury (albeit with a few caveats) of 'our' villa on Meganisi for the last 6 months, there has been something niggling at the back of our minds, and this is it - for the first time since 2007, we haven't had A Plan. Some may say that's the whole point of the cruising lifestyle, but in reality the most 'planless' people have at least a vague idea of where they are heading next. 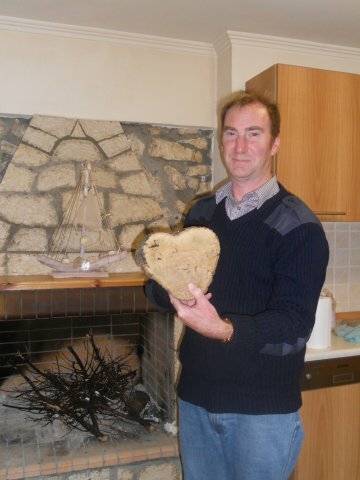 We set off in 2010 with the objective of sailing our yacht from the UK to the Ionian. Last year we achieved that goal, having spent three years enjoying some wonderful places along the way in France, Spain, Portugal, Spain again and Italy. We then spent the rest of last season cruising our new 'local waters' and we intend to do more of the same this year. What we have come to realise though, after 4 years of full time living aboard, is that we no longer want to spend winters aboard, even in the eastern Mediterranean. Having to trudge to ablutions blocks, however 'posh' they may be, and even if they are somewhat closer than they were in Marina di Ragusa last winter, day in, day out, often in inclement weather, does get to be quite tedious. We remember well our first winter aboard in Brittany, beautiful as it was, sliding through the snow to get to the (barely lukewarm) showers... In fact, during the last 4 years, we have met very, very few liveaboards who actually spend 52 weeks of the year living aboard, irrespective of the size or quality of their yacht. Most head home, wherever that may be, or elsewhere, for at least a few weeks, if not much longer, during the winter and/or at other times during the year. Perhaps this gives the optimum lifestyle balance for most yachting folk, including us? As is well documented in these pages, we both enjoy cooking and although we manage to cook some wonderful meals aboard Pipit we do miss a full size kitchen, equipped with full size appliances, with plenty of prep areas, particularly in winter when we are more likely to be cooking hot meals. What have we learnt this winter? 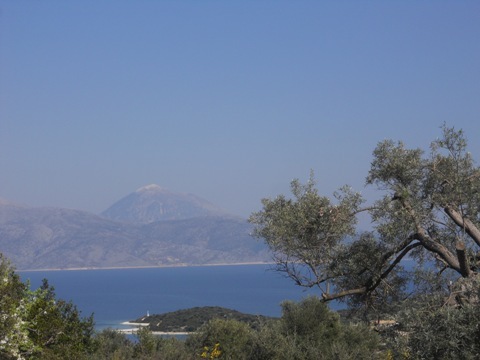 Well, although there are certain aspects of the UK that we miss and will probably return and settle there sometime in the future, we love living on Meganisi and for the time being we are very happy to consider it 'home'. We have also (re-)learnt that central heating was invented for a very good reason - open fires are inefficient, create dust and can smoke when the wind is in the wrong direction. They are also unbeatable as an attraction when they are burning well, but we now know a log burner is the way to go! So we do now have A Plan. When we move back aboard Pipit this week we intend to spend this season exploring more of the Ionian, perhaps venturing a bit further afield than we did last year. This is the kind of sailing we both like - a few hours sailing in glorious weather, with the prospect of a quiet anchorage or useful quay at the end of the day. I (Andy) once harboured (no pun intended) the wish to one day sail into Venice, which may still happen, but not this year, and I wouldn't be devastated if it never happens - from here it is a long way up the Adriatic through Croatia (expensive) to spend a week or so in Venice and then turn round and come back. Another thing we have come to be happy with is that we don't have to go everywhere by boat - Easyjet et al can get you there very much quicker and cheaper! Somewhere else we would like to go is through the Corinth Canal, a spectacular passage, even if it is one of the most expensive 'tolls' in the world! Probably not this year, but maybe next. 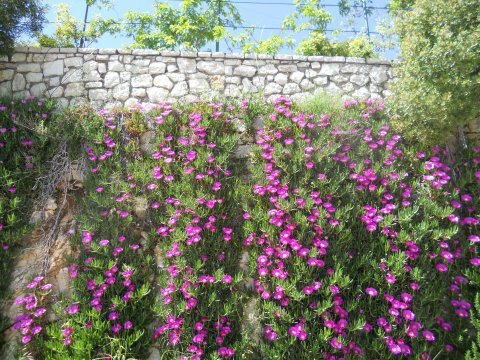 Finally, one last photo from Villa Katopodis - Ice plant, flowering spectacularly on the back wall, and memories for Ann of her childhood garden in California, where her father grew them in abundance.